For any ceramic industry, kiln is the key and essential equipment to produce ceramic products. Ceramics require heat at high temperatures so physical properties can be changed permanently alter the unfired body. In the case of ceramic, clay materials are shaped in tile or other ceramic items, dried and then fired in a kiln. It is a very critical process so utilization of Kiln is also critical. Any ceramic company can't afford less utilization of Kiln as its cost is very high. Any company will strive to avoid less Kiln utilization. BUT THE QUESTION IS HOIN?? Its answer is here. Let's simplify the term utilization of Kiln — it is nothing but how much you are using Kiln in available time without gap. Major reasons for the Kiln gap are Design changeover, body changeover, breakdown of previous or next process, etc. Changeovers are very critical for the company as they are dealing with number of varieties and customer demand may change frequently. Hence any company can't avoid changeover, but company can think to reduce changeover time. To reduce change over time, there is one technique called QUICK CHANGE OVER (QCO). QUICK CHANGE OVER technique focuses on the activities performed during change over. This Changeover activities are divided in to two categories — Internal activities and External activities. Internal activities are those activities which can be performed only when machine or process is stopped. And external activities are those activities which can be performed while machine or process is running. We have implemented QCO in India's largest and well known ceramic company. 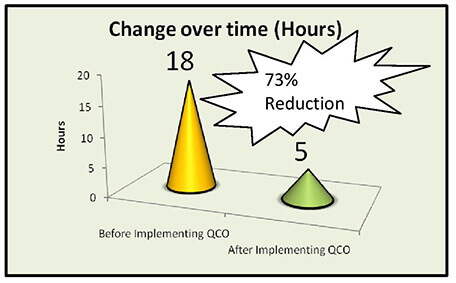 By implementing QCO, We had reduced change over time by 73% that means from average 18 — 20 hours to 4 — 5 hours per changeover.